Traveling around Morocco on a budget can be challenging. If you need a break after long bus rides, the hassle and hectic of Marrakesh’s medina. 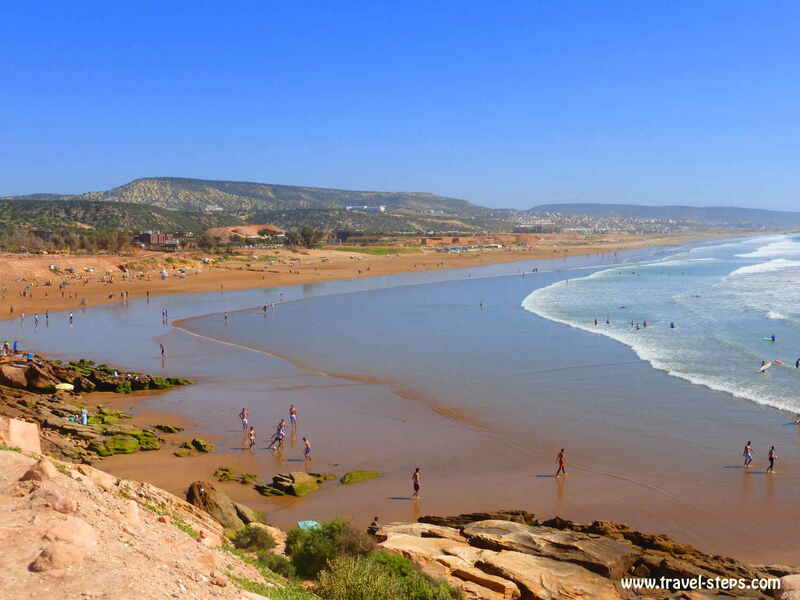 If you are fed up with run down backpacker accommodations in back lanes of busy Moroccan cities – but not ready yet for a package holiday in Agadir – Taghazout is the place to be. 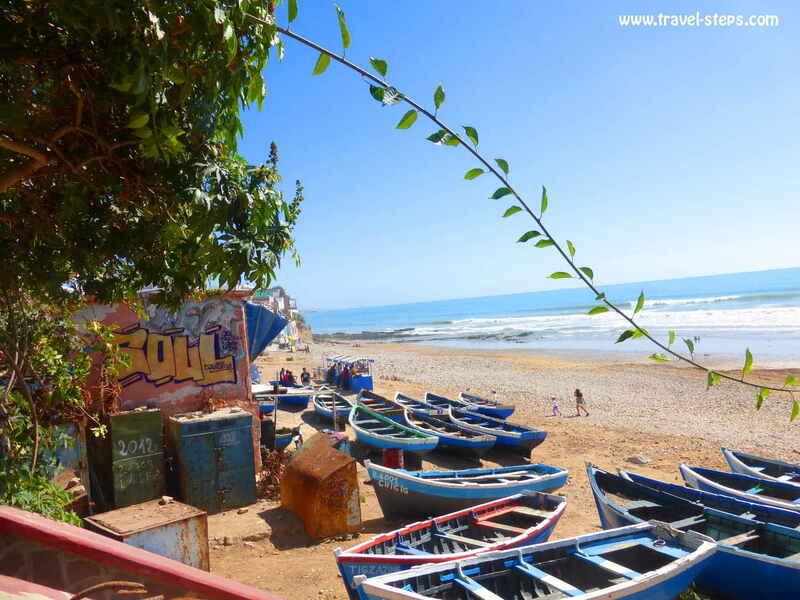 Surfers, hippies and travelers have already discovered the village of Taghazout right at the Atlantic Ocean in the South of Morocco. 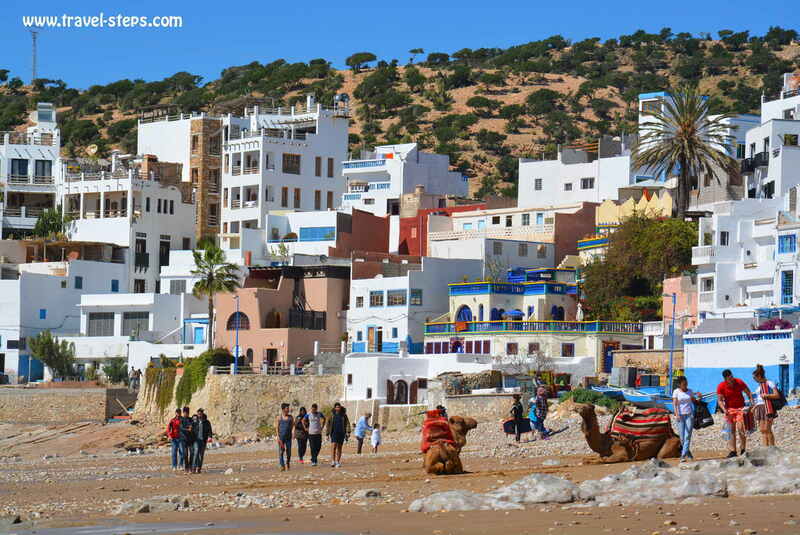 Taghazout is a cool place to stop over on a backpacking trip around Morocco or even spend your holidays there. Travelers will like the prices for rooms and food. Be just aware, that there is no ATM in Taghazout! You need to bring cash or to take a local bus to the next village to go to the ATM! A lot of surf camps offer package deals for advanced surfers and beginners. 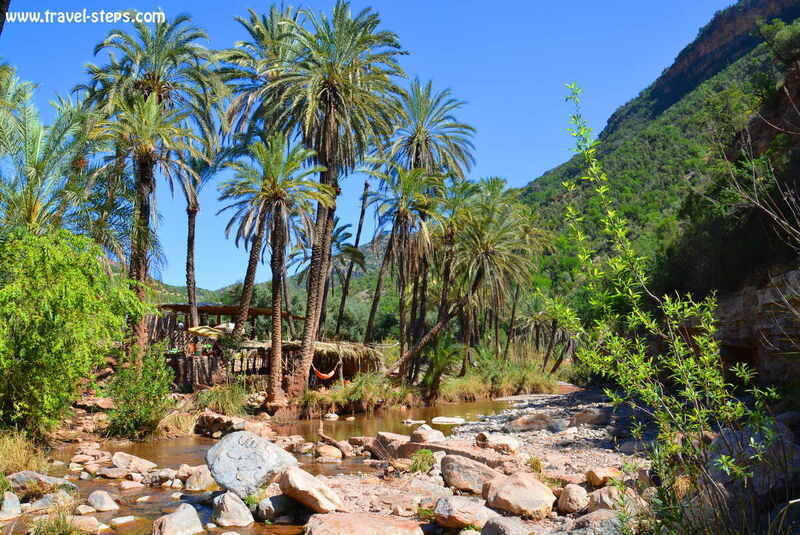 Moreover, Taghazout is a great base for a trip to Paradise Valley. We discovered Taghazout on our backpacking trip around Morocco in March 2017. And we cannot wait to return! On this page, you will get some advise about where to eat, where to sleep, what to do and how to get to the amazing Paradise Valley! In Taghazout, the waves are louder than the sounds of the local Mosque. Especially western travelers will realize, that man many locals wear surfboards, board shorts and long hair instead of beards and burkas. It’s one of the few places in Morocco apart from Agadir’s tourist beaches, where men running around bare-chested will get no bad looks. In Taghazout, it’s possible for women to go swimming in bikinis or about showing their legs in summer. Well, it’s still sensible to keep in mind, that you are still in a Muslim country with certain rules of how to dress properly or to behave. But the whole atmosphere in Taghazout feels like being in a relaxed holiday village. 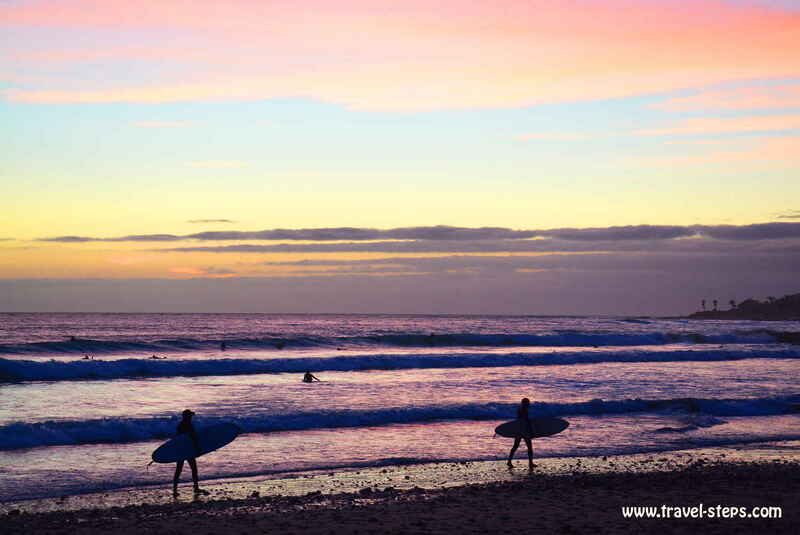 With its surf schools and surf board rentals, it’s a good destinations for all those, who love water sports. When we arrived in Taghazout on our backpacking trip around Morocco by bus from Essaouira, we fall in love with Taghazout immediately. The bus from Essaouira to Agadir stopped on the road to Taghazout, around one kilometer away from the small fishing village. It was around 30 °C outside in March, which was unusually hot. No clouds. The sun was watching us. We had to walk downhill for ten minutes and we already felt, that we had arrived in a very special place, where time is running slowly. We saw surf boards everywhere. Surfers were walking by in wetsuits, some of them were speaking the Moroccan Arabic dialect Darija, others sounded American, Australian, English or French. 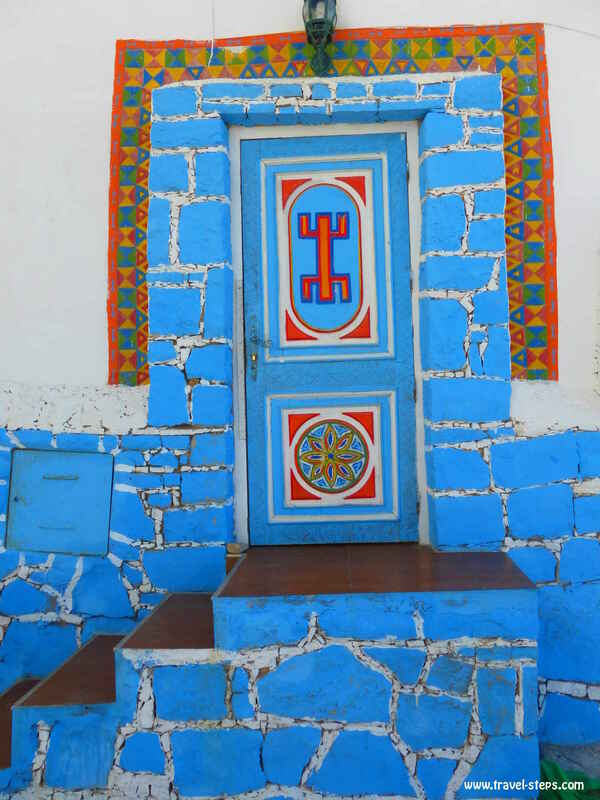 We saw colorfully painted houses, fishing boats, street art, restaurants at the waterfront with names like „Surf Berbere“ and „Rasta Pasta“, small shops and souvenir stalls. It was the third time, that we were visiting Morocco. Why haven’t we heard of Taghazout before? With a bit of luck and maybe also online research, you can get a room for two people for around 100 – 200 Dirham. Of course, there are also more expensive rooms available. Depending on the time of the year, you might be able to look around and bargain. Even if it was not necessary, on our backpacking trip to Taghazout in March 2017, we booked a room in the Ocean Surf House two days in advance, because we had found the very cheap offer. 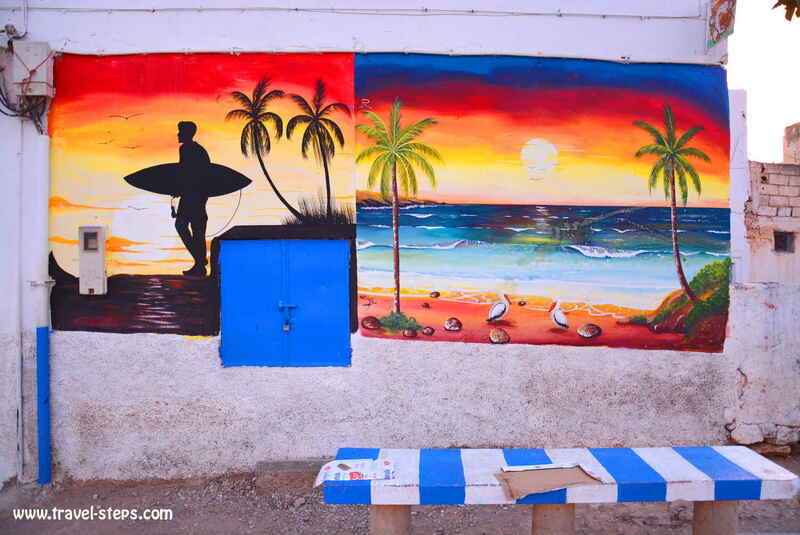 When we arrived in Taghazout, locals just showed us the way to the Ocean Surf House. You cannot get lost in Taghazout. Everything is close by to everything. And as soon as we met one of the owners of the Ocean Surf House, we knew, that we had made the right choice. Abdu was a cool surfer, who did everything to make us feel welcome. Really at home. In his house, all is kept very simple, but what do you really need, when you can fall asleep while listening to the sound of the ocean? 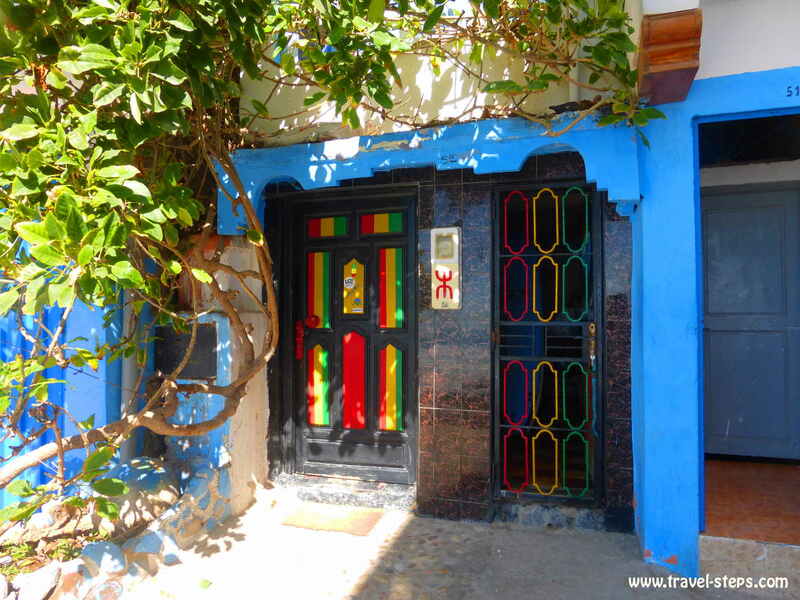 We had planned to stay for two nights in Taghazout, but ended up staying for one week. It was also the roof terrace with comfy couches and sea view, the very chilled out atmosphere and the good prices, that convinced us to stay. We paid 100 Dirhams (10 Euros) for a room with sea view. It was a really good deal, but the price might differ at another time of the year. It was a simple room. But who needs always a hot shower with temperatures around 30°C outside, when you can lie on the roof terrace at night watching the amazing stars? In total, the Ocean Surf House in Taghazout is rather a spot for budget travelers and surfers, who like chilled out vibes, than for holiday makers looking for some luxury. Find information about the Ocean Surf House in Taghazout. Eating breakfast, a Moroccan salad, a tajine or a burger right at the waterfront, while massive waves are splashing against the rocks next to you: Every meal at the waterfront in Taghazout can be a unique experience. And be careful: Sometimes, some of the water might splash on your table! But that is part of the experience. 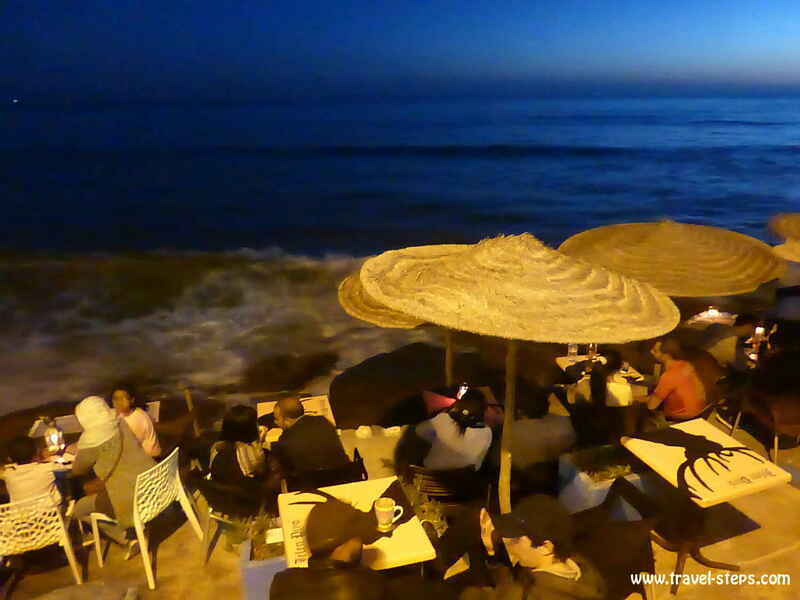 There are a few restaurants at the beach of Taghazout. 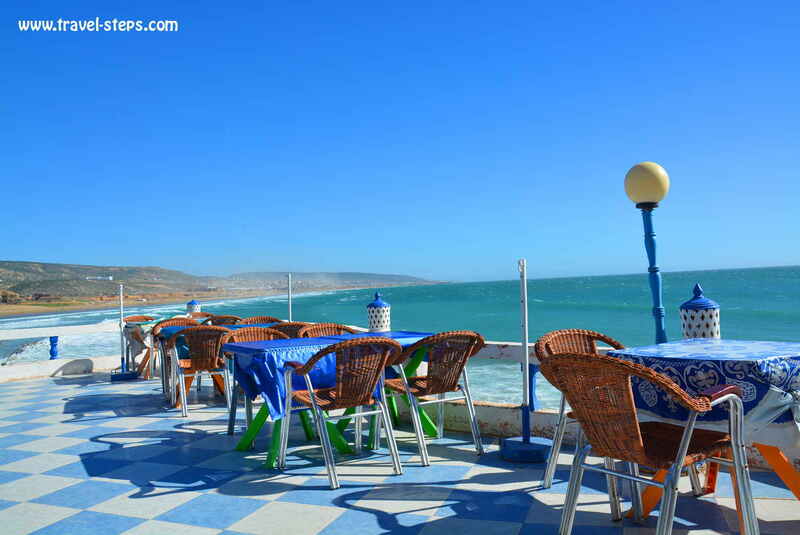 We tried a few and always ended up again at the Surf Berbere, where they also offer food and accommodation. In the Surf Berbere restaurant, cool guys were serving really good food in a relaxed atmosphere for reasonable prices. A vegetable or chicken tajine with bread and olives would cost you around 35 Dirhams, a plate of chicken escalope in creamy sauce with fries and salad 45 Dirhams. It sounds a lot for many budget travelers. But we found the prices for quality food in a prime location very good. And yes, we also had cheaper meals in Morocco, even in Taghazout including bones, gristle or pieces of fish heads with eyes on our plates. Find information about Surf Berbere. 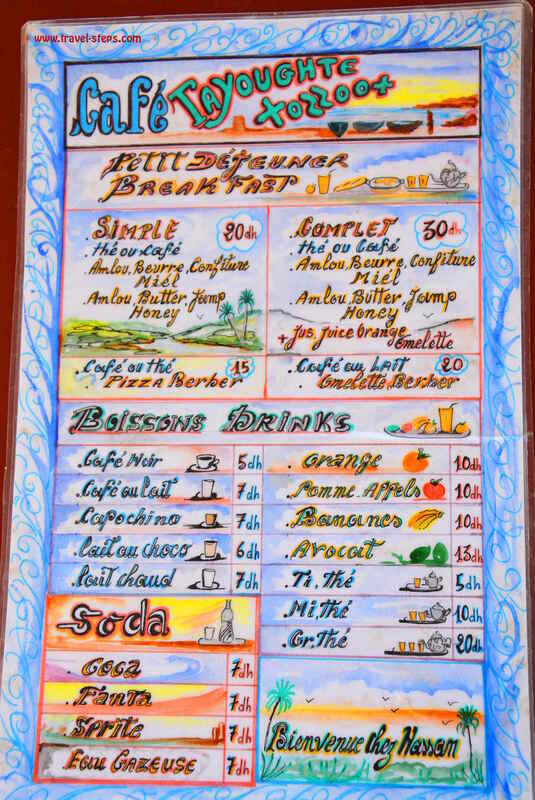 In general, you will get almost everywhere in Taghazout a complete breakfast with tea/coffee, orange juice, bread, jam, eggs and cream cheese for around 25 to 35 Dirhams per person. Main dishes like tajines start around 25 Dirhams in local places in the town center. Be careful: The cheapest deals are not always the best. It might sometimes be worth to spend just 5 Dirhams more for a more decent meal in a nice location. A big sandwich with fries on the main road will cost you something between 12 and 20 Dirhams. For the sea view, you sometimes pay a bit more. Fresh juices are available for around 15 Dirhams, a coffee or tea depending on the café or restaurant between 5 and 12 Dirhams. And if you are on a very low budget, you can still buy some bread (1-2 Dirhams) and prepare your own sandwich. There are some little shops in Taghazout. Activities in Taghazout? It’s about being there! A lot of people always ask really quickly: What can we do there? What are the activities in Taghazout? Wrong question in Taghazout. It’s not about doing anything there apart from surfing. It’s about being there. Play in the waves. Or let the strong currents play with you. Sunbathe. Drink healthy juices. Read. Laugh. Write. Relax. Take photos. Buy some raspberries or strawberries. Stroll along the long sandy beach. And if you are not a surfer or taking part in a surf camp, you can still take some lessons. 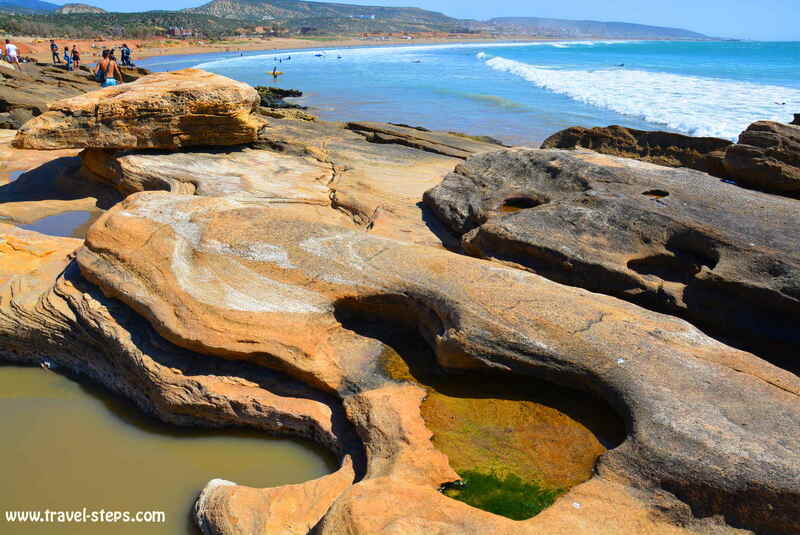 Names like „Hashpoint Surf Camp“ or “Surf Berbere” might inspire you. If you get bored, join one of the unfortunately slightly overpriced yoga classes of the guest houses We saw offers for around 100 Dirhams per hour per person, which is a lot in comparison to local food and room prices. Another thing to do in Taghazout: Hop on one of the camels or horses, that the Berber people take to the beach for trips every day. Or go on a day trip to the legendary Paradise Valley. The good thing about Taghazout is, that people will leave you be yourself and let you be by yourself. The shop owners didn’t hassle us. No one made us feel like walking money-bags. Almost everyone was open for a little chat. I was really surprised about that, because it is a tourist place after all. One guy told us, that it is always quiet in winter and spring in Taghazout with the international backpackers and surfer around. That is the best time for individual travelers in Taghazout. In summer, the Moroccan tourists invade the place. Prices in guesthouses might rise. In theory, Islam forbids the consumption of alcohol. 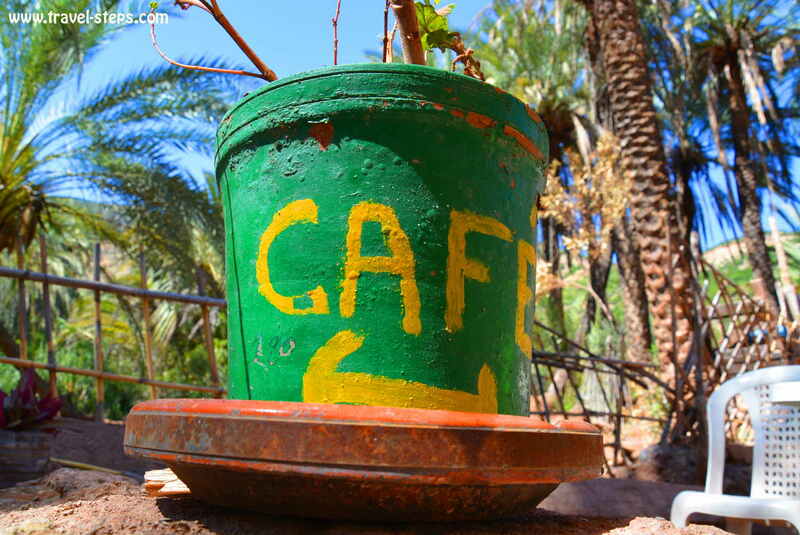 All around Morocco, alcohol is just sold in licensed shops and tourist areas, that are not to find at every corner. There is no shop officially selling alcohol in Taghazout. But even in Taghazout, there are a few bars outside the city center offering alcohol. One of them is the more expensive hotel and surf house „Sol House“. So don’t expect prices of alcohol to be much cheaper than in your home country (well depending on where you are from). Travelers told us, that a beer in a bar in Taghazout costs around 25 to 50 Dirhams. In Agadir, it’s much easier and cheaper to buy alcohol in shops and different bars, because it is a tourist area. In Taghazout, we didn’t see anyone drinking in public. And it’s probably a good advise not to do so. Taghazout is good for everything, but it’s clearly not a party place, where people are going crazy. Personally, we really liked the very chilled out atmosphere. 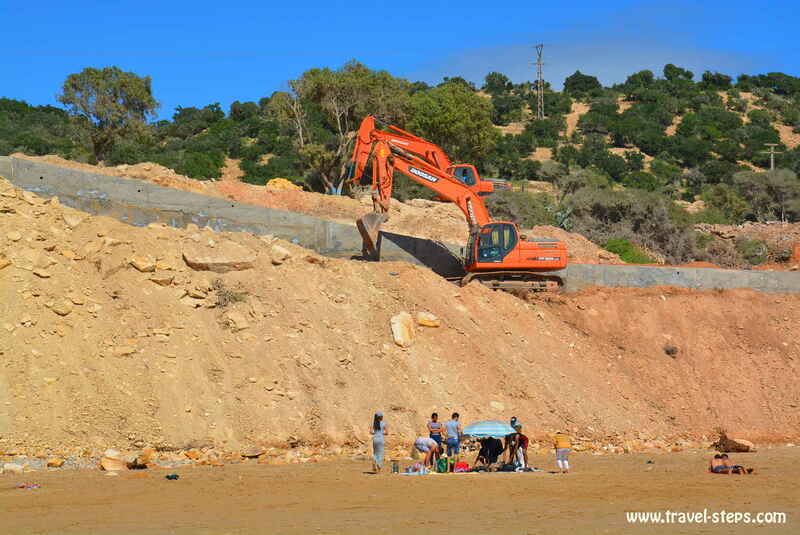 With a bit of suspicion, we realized some construction work going on at the back of the long sandy beaches of Taghazout. Some luxury hotels in the hills had already opened their doors. Some more projects will be finished obviously during the next years. It’s probably a good idea to visit Taghazout soon – before the whole atmosphere might change. You never know. We just really hope, that the place won’t turn into a second Agadir. 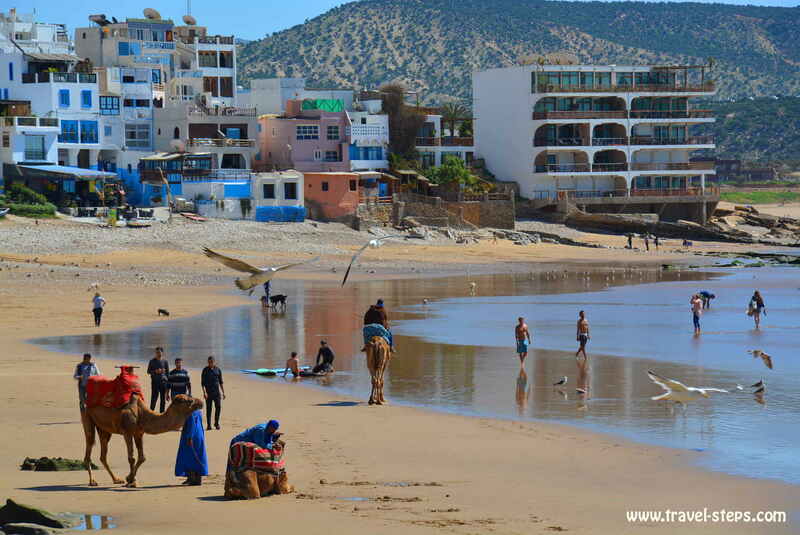 Taghazout is definitely a place, where women traveling by themselves can walk around without getting hassled. Still, we didn’t see a lot of female single travelers. But there was quite a number of single female travelers taking part in surf camps. That might be a good option to meet fellow travelers. Especially, because evening action apart from going for dinner, going for a walk, listening to the waves, socializing with surf camp buddies, reading or writing a diary is really limited. Moreover, many backpackers are traveling in Morocco in pairs or groups. If you have time and some extra money: Go to Paradise Valley. It’s a very cool spot. I read in my guidebook, that hippies had lived there in caves in the 1970s. Today, locals are selling fresh orange juice, soft drinks and tajines to visitors. But even if more and more people are going there nowadays, the beauty of the nature is still there. The whole tourist business there is still very low-key. You find some chairs and hammocks in front of huts instead of flashy restaurants and bars. Concreting of paradise luckily hasn’t started there yet. It’s an oasis surrounded by palm trees. Rock pools with fresh clear water invite for a swim together with little fish on hot summer days. Brave people jump off the rocks. Some young guys were playing drums. Families had picnics. We loved the place. 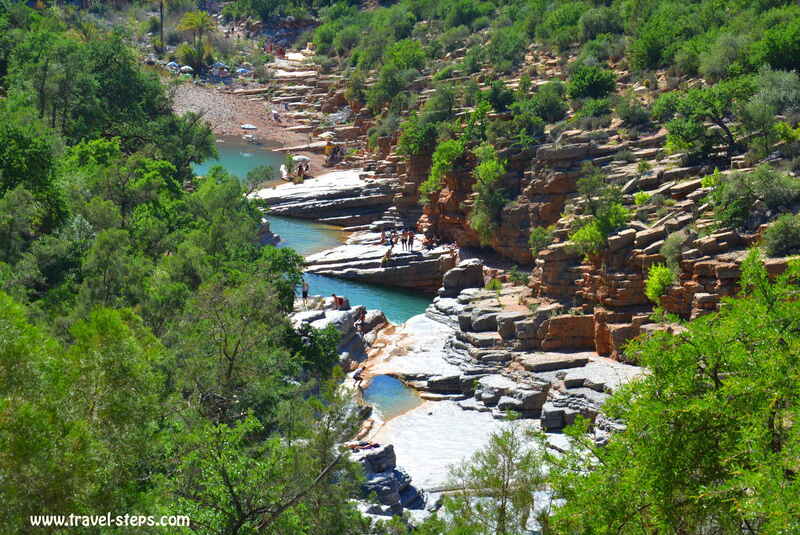 To do a day trip from Taghazout to Paradise Valley is a good idea, because it is not far away. Maybe 40 kilometers. The road from Taghazout to Paradise Valley is not very tricky. But allow yourself around one hour by car. It’s not far from Taghazout and not difficult to drive, but the road is at some parts in a bad condition and surrounded by mountains. You need to drive slowly not to risk cracks on your front window because of stones. 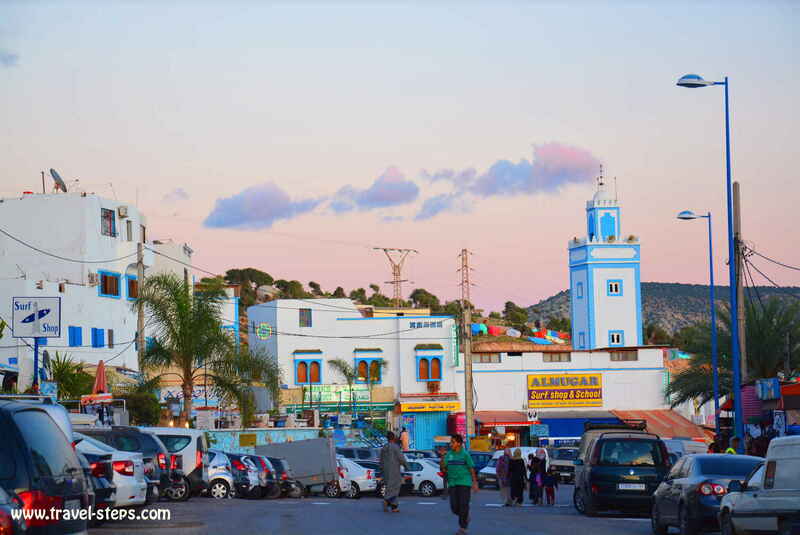 The road from Taghazout leads you through the busy town of Aourir, where you find a proper petrol station. If you don’t have enough petrol left, use that opportunity! There are no more petrol stations on the way to Paradise Valley. We were a little stupid, because we forgot about that. We underestimated the distance and the mountains. It went all well, but the fact, that we didn’t have much petrol left in our car didn’t make our trip more relaxed. By the way, in Imouzzer, petrol is supposed to be available in bottles. In general, petrol costs around 10 Dirham per liter (March 2017) at the service stations in Morocco. 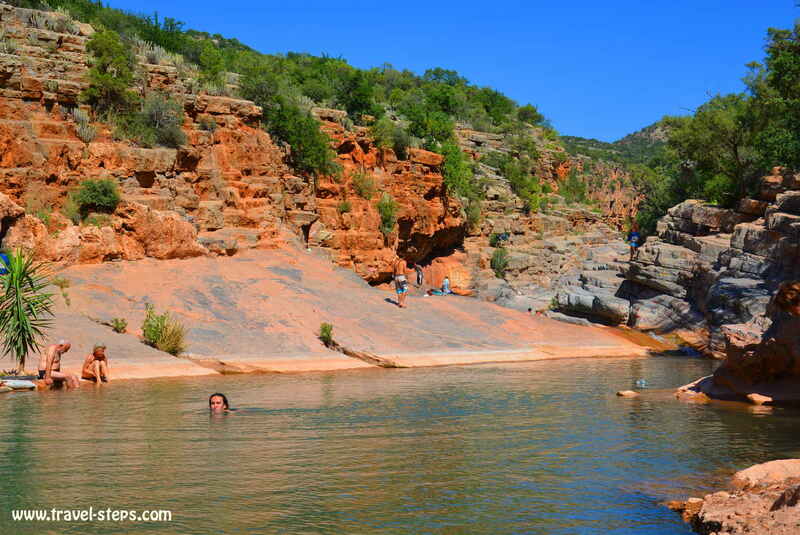 You will see the entrance point to the Paradise Valley rock pool hiking trail. Usually, there are a few cars parking there. Car-park attendants charge 10 Dirhams. We got the advise not to go to Paradise Valley on a weekend, because it is supposed to be very busy on Saturdays and Sundays. On a weekday in March, there were never more than 50 people there at the same time. And we enjoyed the whole scenery a lot. It’s probably a 20-30 minute walk from the car park to the rock pools. You can also follow the hiking trails for a longer walk. Rental car, package tour, taxi or bus to Paradise Valley? 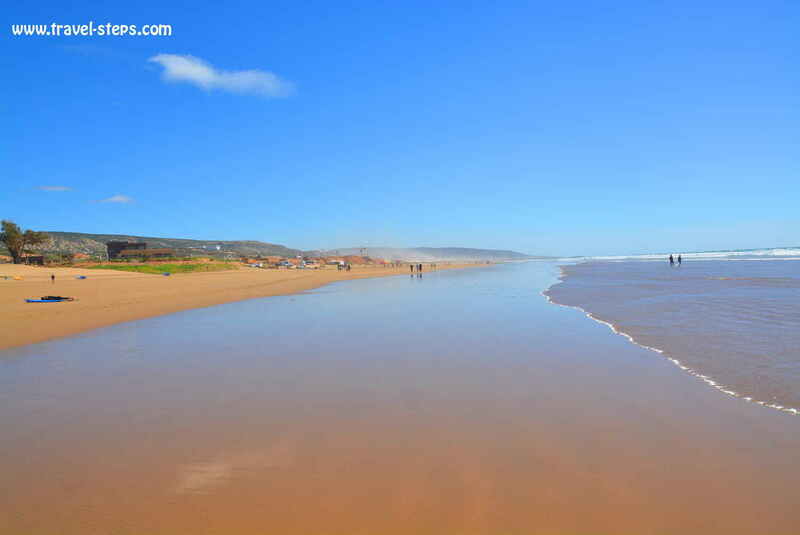 You have different options to go to Paradise Valley from Taghazout and also from Agadir. Package tour, rental car, bus or taxi. After comparing the prices of the different options, we took a rental car from Taghazout to get there. 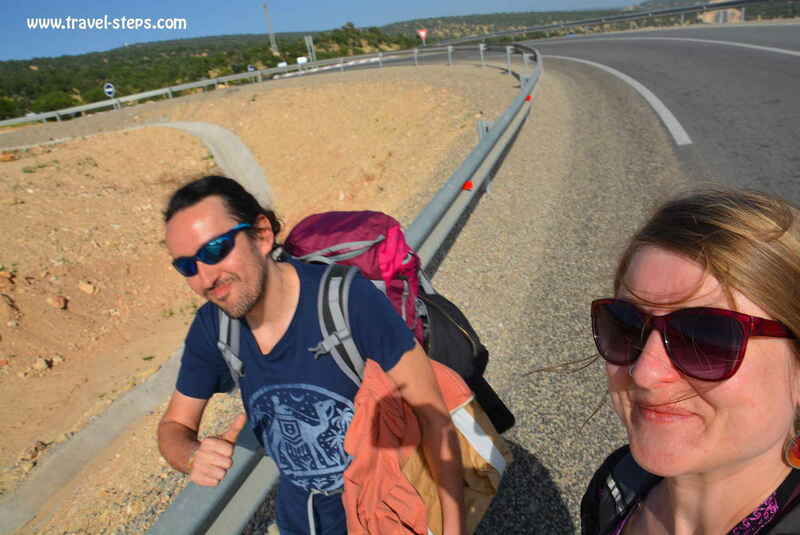 We paid 250 Dirhams per day for the car including insurance – plus petrol. You can try to bargain everywhere, otherwise you will probably pay more. Don’t expect too much, when you rent a car. We were a bit surprised, when we saw the car for the first time. It had a few scratches, dents and also cracks in the front window. At least, we didn’t have to fear more damages. Best condition to start driving on African back roads and to face the chaotic small town traffic of places like the neighboring town of Aourir. There were lot’s of school kids on the road. Many cars were honking. Too many people. I wasn’t used to driving a car in Morocco. It’s no big deal, but I had to take care behind the wheel. And I realized quickly, that everyone was driving carefully. In Aourir, you also find a petrol station. There is no petrol station in Taghazout. Unluckily, there was hardly any petrol in the car, when we rented it. We just realized that after we started driving. I was not really happy about that. But with a bit of good luck, we made it to Aourir. It took us around one hour to go to the Valley of Paradise. 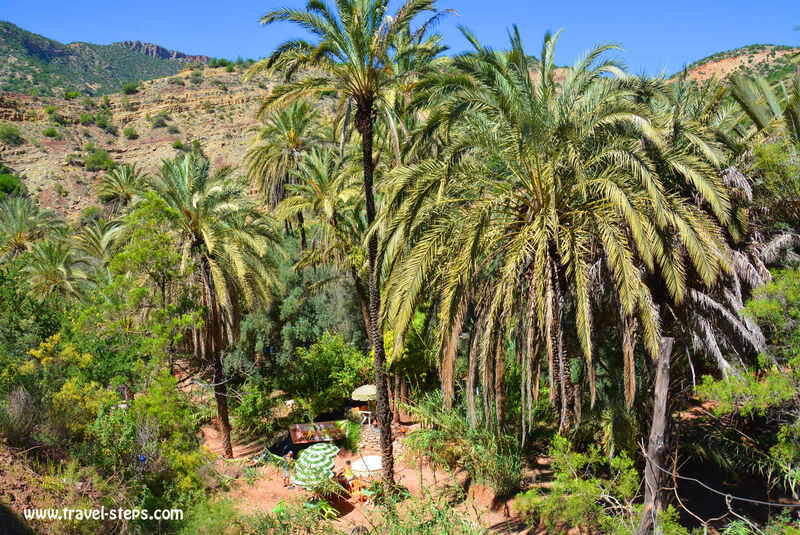 In Taghazout, some agencies offer tours to Paradise Valley. The prices are often depending on the number of participants. We got deals offered between 100 and 350 Dirham per person, the more expensive ones including lunch and a guide. We took the rental car instead to be more flexible. But it is always worth to ask in your hotel or guesthouse. They might even be able to organize a trip or a package tour for you, which can be fun especially when you are traveling alone. Getting to Paradise Valley by public transport from Taghazout is possible, but involves a bit of combination of the bus Nr. 32 to Aourir and shared taxis into the direction of Immouzzar. Paradise Valley is on the way. The Grand Taxi should leave every few hours from Aourir, if there are enough people. The price should be 30 Dirham per person. We didn’t try it ourselves. When people tried to explain the public transport from Taghazout to Paradise Valley to me, it didn’t sound as if you can make it there and back reliably and comfortably in one day. 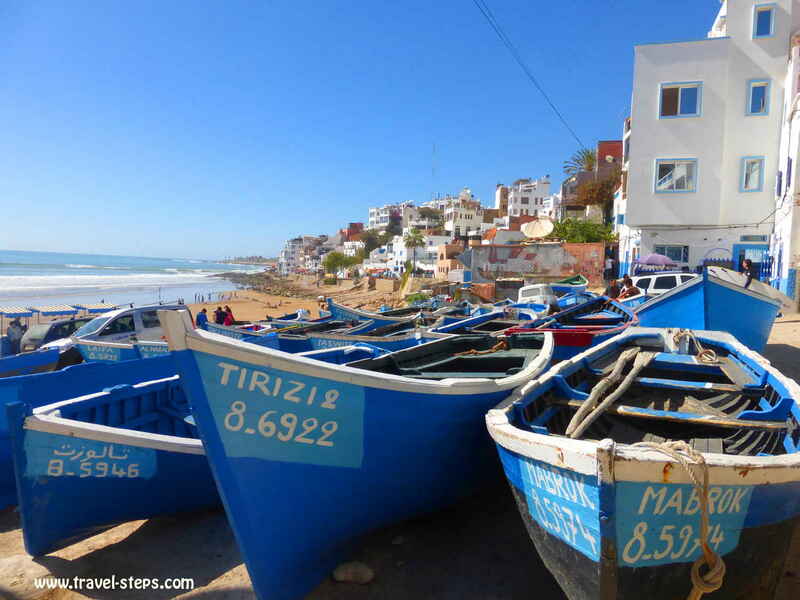 Before you go, better ask the locals in Taghazout how to do it. And in the worst case, it might be possible to get a lift back from Paradise Valley to Taghazout or Agadir with one of the tourists or to stop a car. For sure, you can also charter a taxi for a day and share the costs with fellow travelers. We got offered prices in Taghazout for around 400 Dirhams per day per taxi. 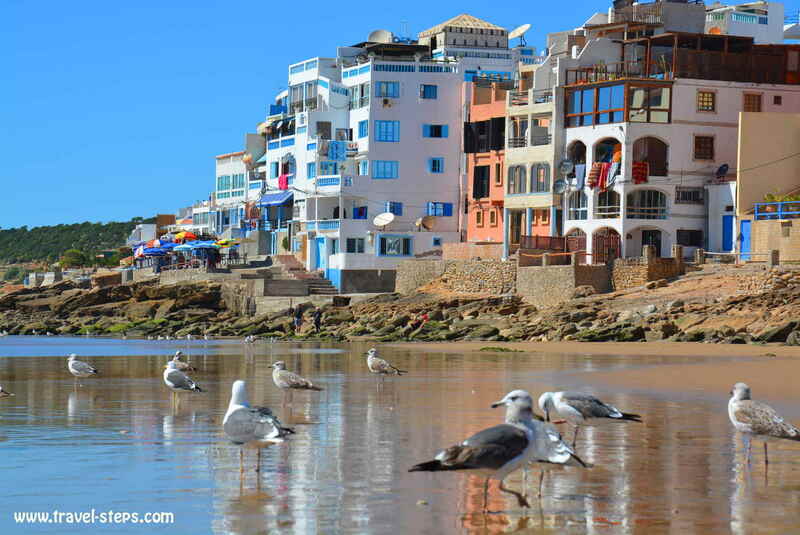 From Essaouira, it is just a 3-4 hour bus ride to Taghazout. Go to the public bus station in Essaouira for your own convenience at least one day in advance and explain at the ticket office, that you want to go to Taghazout. Pretty much all buses of the private companies on the way from Essaouira to Agadir can stop there, even if it is no regular stop. But in Morocco, bus drivers can be very flexible. There are quite a lot of buses running to Agadir. It should not cost more than 50-60 Dirham (5-6 Euros) depending on the company. Plus a 5 Dirham tip for one piece of luggage. In Essaouira, they try to make foreign travelers pay 10 Dirham. But 5 Dirham is the normal price for one piece of luggage all around the country. Don’t be surprised: The bus doesn’t stop directly in Taghazout. They will probably let you get off the bus on the road to Taghazout. You have to walk around one kilometer downhill into town. But the walk to surfer’s paradise Taghazout won’t take you longer than 10 minutes. From Agadir it is just a half an hour bus ride to Taghazout: If you arrive directly at the bus station in Agadir (Gare routière de Voyageurs Agadir), take bus No.2 directly in front of the bus station into the direction of the city center/beach/harbor (2-3 Dirham). Get off that bus Nr. 2 again on Boulevard Mohammed IV close to the harbor. Better ask the bus driver. Along the Boulevard Mohammed IV, you can change into the bus line 32 directly to Taghazout (7,5 Dirham). You will probably not understand by yourself, where to change buses. Ask the bus driver. They usually speak french or english and are really helpful. Public transport is usually not self-explaining. Going anywhere for the first time by public bus in Morocco probably means, that you have to ask local people a lot. That’s the way! Once in the bus Nr. 32, Taghazout is the final stop. You cannot miss it. The bus ride from Agadir takes around 30 minutes. Buses to Agadir leave Taghazout every 30 minutes. Don’t believe immediately anyone, who is telling you anywhere in Morocco, that there are no public buses and that you have to take a taxi. We had that again and again. But there usually are buses to almost anywhere. Especially from and to bus stations. Just airports are sometimes really difficult to reach by public transport. Taghazout is one of the places in Morocco, that me and my partner definitely want to return to. Some places are nice to visit, to see and to experience. But some places make you feel good, welcome and relaxed. Taghazout is one of these special places. We have been to Morocco three times, but just discovered Taghazout in 2017. Spring was the perfect time to be there. And we are really happy, that we saw Paradise Valley! 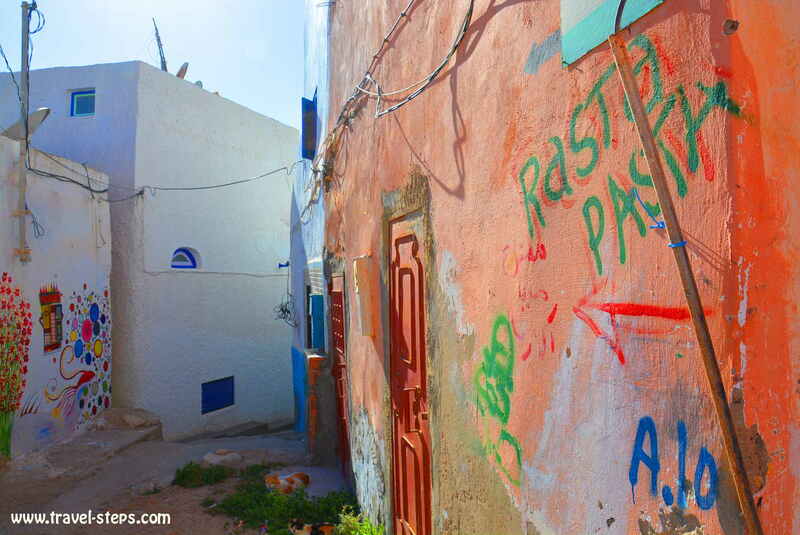 Read more about our backpacking trip to Nador, Chefchaouen, Fes and Essaouira here. Read more about our backpacking trip to Marrakesh, Essaouira, Agadir and camel riding in the Sahara here.